We continue to expand the number of peaceful animals that can be beneficial. This time you will get a very beautiful camel. You will really like this excellent mammal if you live in deserts or steppes, where there is sand everywhere and there is no water. The camels do not require much attention and can find food on their own. How to find the camels? If you are spawned in a forest or plain, then you will see one or several camels almost immediately. 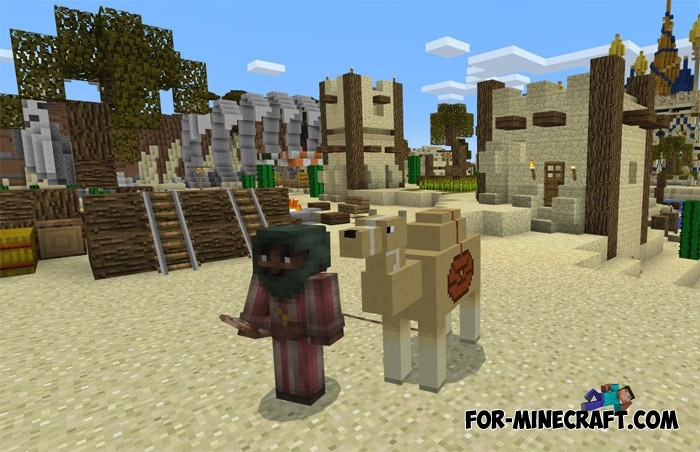 The Camel addon replaces pigs, but you will need a leash to not lose your pet. As you know, camels are used not only for riding, but also for transporting a large number of items. There are 27 slots that are commensurate with a simple chest. Things will be stored there until you take them or your camel dies. Do you want to diversify your world? Then the Animals addon is a great opportunity to do this, because it adds 11 quality animals.